Sovereign Rights over natural resources in the forest region have always remained a core demand of forest dwelling communities since the colonial days when British colonial power imposed its forcible authority over all natural resources, thus denying the traditional symbiotic relationship between communities and forest resources. Once colonial power established its eminent domain to plunder all natural resources for its needs to expand the Empire, a conflict situation was created between the colonial state and the indigenous communities and unfortunately this plunder has continued in the post colonial era too. Innumerable heroic struggles were fought against the colonial state by the communities - led by exemplary courage and conviction by the subaltern leadership from amongst the Adivasi people with their indominatable spirit, creating a glorious heritage of struggle. The struggle continued even in the post colonial era demanding justice from the independent and post independent Indian state, which however carried on with the system of eminent domain in the forest regions and the conflict continued. 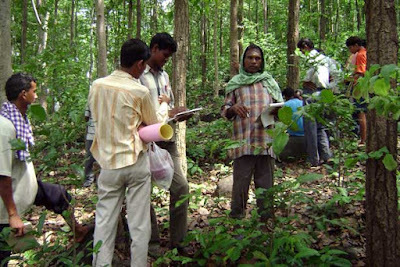 After about 60 years of Independence, under UPA1government, a progressive legislation, Schedule Tribe and other Forest Dwellers, Recognition of Forest Rights Act was enacted by the Indian Parliament on 15th December, 2006 which came to be popularly known as Forest Right Act (FRA) to mitigate the conflict situation in the forest region, and , as the preamble of the historic act says, to end the ‘historic injustice’ on the forest dwelling communities. The Act ensures individual tenure right over cultivable land and more importantly collective ownership right over all NTFP and on forest based resources to the Gram Sabhas, duly elected by the community members. But even after almost a decade the promised end to the historic injustice is yet to come. The government never showed the necessary political will for effective implementation of such a progressive act which is meant to bring about a structural change in forest governance. Rather, things are now moving in the opposite direction. The present NDA government is very much intent to change the basic feature of the act. In fact, the government has introduced dangerous moves by declaring a cut off date for claiming of rights, passing the CAMPA bill and again to involve corporates in plantation activities in degraded forest areas. All these steps are against the rules of FRA and would endanger the rights of communities. The state has also been mischievously trying to create divisions among the Adivasis and other forest dwellers pursuing the policy of divide and rule. Inevitably, this would create a situation where conflicts between people and the state will increase as organized communities with their emerging consciousness will resist any effort to dilute their rights. This may create a situation where we can see more state oppression and more open commoditization of resources. In this context forest right movement now has to be seen as a struggle against corporate driven state, necessitating a new alignment of social forces and especially of natural resource based primary producers. Forest rights, and specifically the implementation of the Forest Rights Act, is fundamentally a political challenge. Because ensuring implementation of Forest Rights Act is now actually passed on to the people – the forest dependent people, something which will potentially alter the very balance of political economy in post colonial India cannot but be a political fight. It needs to be remembered that such rights have been restricted and obstructed by the existing political economic and social structures where dominant capitalist force rule over the resources. And this process of restricting and then taking away rights of the forest dependent people started in colonial India has been continued in independent India. So by just asking for, pleading to the government to implement Forest rights Act to eradicate “ historic injustice” as envisaged by this special act of the Parliament of India is not enough. The Indian political establishment has to be challenged through a democratic political movement by the forest dwelling communities with active support from other natural resource based working peoples’ movements – whether it is the movements for land, water or minerals or fisheries . It needs to be clearly understood that capital, though in deep structural crisis, is still dominant and governments, in this era of capitalism euphemistically called the era of neo liberalism, are subservient to capital and its allies in the region – landlord , land mafia, vested interest, which also constitute the class basis of capital. And it is this class representing capital which has to be politically challenged. It should be very clear to us that governments at the Centre or in the States will not take up this challenge, even if constitutionally mandated, to destabilize these forces because they are politically dependent on these class forces for their own political existence. Very recently, Indian state by imposing demonetization of higher level currencies is bent upon to extract whatever limited resources people have for benefiting corporate interest and thus uprooting common people from their livelihood and making them economic refugees . In such a situation the demand for Forest Rights has to be seen in the larger context, more holistically, along with the movements for Land rights, fisheries rights, mining rights and a co-ordinated and complimentary struggle has to be launched for achieving success; it is not possible for any such struggle to be successful separately. This is a political lesson which we should all imbibe and take as the basis of moving ahead in our struggles. It is a decade since 2006 when the Forest Rights Act was passed. When we look at our successes and failures the biggest lacunae which comes across is the failure of the Forest Rights movement to attain political maturity barring a few exceptions, to challenge the political status quo. But the coming together of different political streams and mass movements to oppose the proposed changes in the Land Acquisition Act by ordinance and the success which it has achieved through this joint action by forming a platform of landless, poor peasants, agricultural workers, forest dependent working people, the Bhumi Adhikar Andolan, supported by all national trade unions and also by opposition political parties, proves the necessity of moving on to a new era of political alliance at the mass movement level which has the potential to alter the balance of political forces. Collectively taking up this challenge should also inspire the progressive forces to join or at least support the peoples’ struggle. The determination and resolve shown by the Trade Unions in their united action in making general strike of 2nd September,2015 a successful struggle and the recent unrest of academicians, intelligentsia and professionals against intolerance has again recreated a space which had closed out over the last two decades because the intelligentsia had distanced themselves from peoples’ movements. If such forces can provide active support then a great opportunity will be created for strengthening forest rights/ land rights movements to take up the political challenge. In this context , Bhumi Adhikar Andolan (BAA) a joint platform of landless , poor peasants, agricultural workers, forest dependent working peoples’ organizations – representing major mass organizations across twenty states have decided to observe 15 December - Forest Rights Day, day of challenge and warning. This will indeed be a unique occasion when diverse peoples’ movements, mass organizations would come together to declare a decisive struggle which would logically lead much beyond just Forest Rights. We appeal to all progressive, mass based, people centric organisations to join forces on 15 December 2016 in Delhi to give a clarion call to decide on comprehensive agenda to achieve sovereign rights over forest,land,water and other natural resources and to fight against forced land acquisition, agrarian crisis and fascist politics.